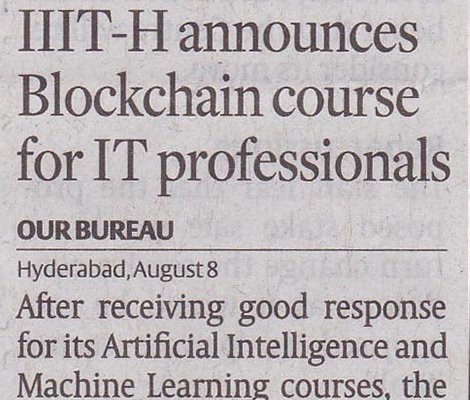 HYDERABAD, AUGUST 8: After receiving good response for its Artificial Intelligence and Machine Learning courses, the International Institute of Information Technology (IIIT-H) and skilling company TalentSprint will offer an Advanced Certificate Programme on Blockchain Technologies and Solutions. The three-month programme will enable in-depth understanding of Blockchain technologies and how to develop complex solutions for integrated financial systems, supply chain and other industry applications using Blockchain. The fee will be around ÃƒÂ¢Ã¢â‚¬Å¡Ã‚Â¹2,00,000. The programme will be run by faculty from the Blockchain Research centre and experts from TalentSprint. IT professionals with a minimum one year experience can apply. We are looking at a batch of 100- 125 that is kick-starting in the first week of October,ÃƒÂ¢Ã¢â€šÂ¬Ã‚Â Ramesh Loganathan, Professor Co- Innovation practice at the institute, said. Citing an industry survey, he said there was a seven-fold increase in the demand for professionals with Blockchain skills. ÃƒÂ¢Ã¢â€šÂ¬Ã…â€œWe have been running courses on Blockchain for our students in the campus. 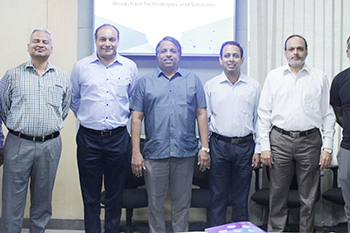 We would like to offer a course for professionals, seeing huge demand for people with Blockchain skills,ÃƒÂ¢Ã¢â€šÂ¬Ã‚Â IIIT-H Director PJ Narayanan said. 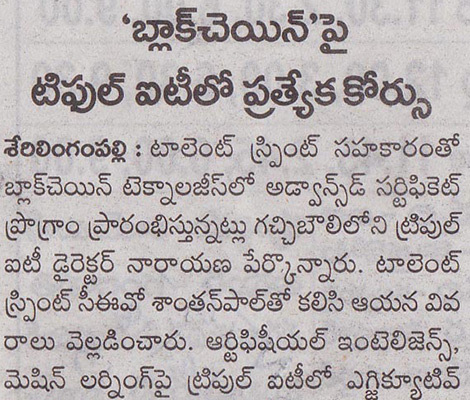 Experts at the session noted that Hyderabad has been progressive in embracing Blockchain. Hyderabad: Fewer women techies are interested in learning new technologies be it blockchain or Artificial Intelligence, according to a survey conducted by IIIT-H and Talent Sprint. Learning new technologies has often suffered from the gender skewed ratio especially at premier institutions. ÃƒÂ¢Ã¢â€šÂ¬Ã…â€œWomen have low representation (25 per cent) in the IT industry. Only when we can erase the myth that women are bad at programming, more women will be willing to learn. 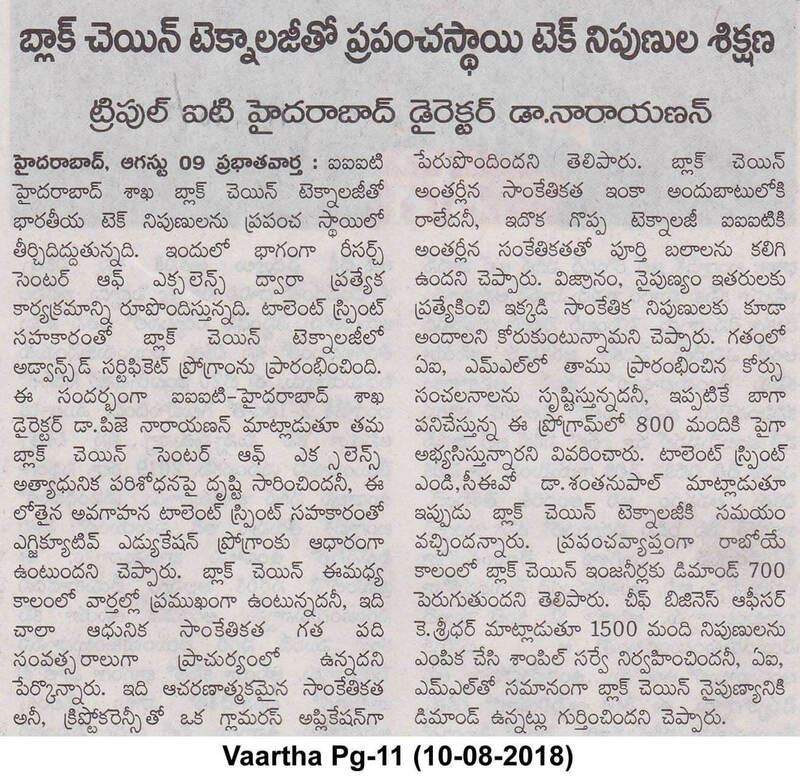 For the learning courses, IIIT-H is offering scholarships for women because of which we can see more women coming here than to other institutes,ÃƒÂ¢Ã¢â€šÂ¬Ã‚Â said Mr. Ramesh Loganathan. 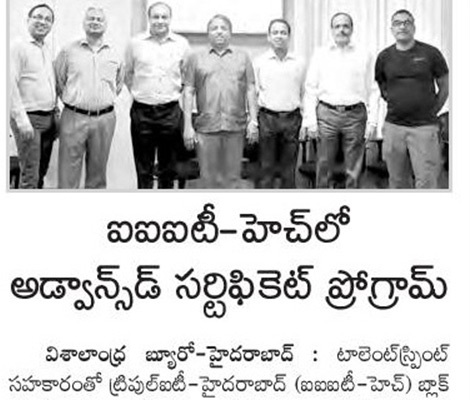 IIIT Hyderabad Association along with Talent Sprint on Wednesday has announced the launch of an Advanced Certificate Program on blockchain Technologies and Solutions. According to a survey of 1,500 participants, people with 4-10 years of experience are looking to learn Block-chain which is catching up with AI/ML. Nasscom estimates that blockchain has the potential to create value of up to $5 billion in India in the next five years. 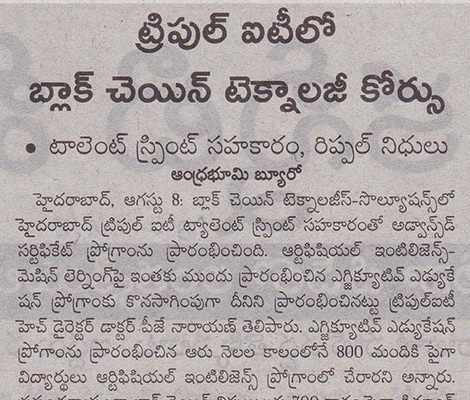 Experts at the session noted that Hyderabad has been progressive in embracing Blockchain. The three-month program will be delivered by faculty from the Blockchain Research CoE and practitioners from Talent Sprint, with extensive hands-on assignments and capstone project. 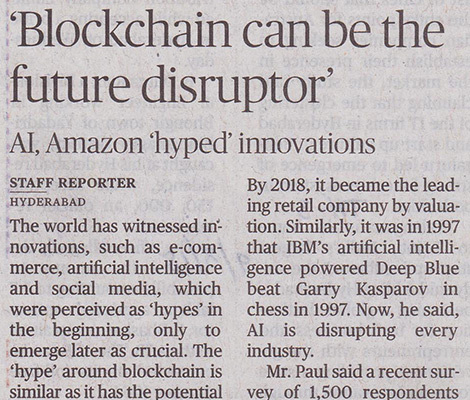 'Hyped' innovations like AI, Amazon were disruptors The world has witnessed innovations, such as e-commerce, artificial intelligence and social media, which were perceived as hype's in the beginning, only to emerge later as crucial. The hype around blockchain is similar as it has the potential to cause disruption in key areas. 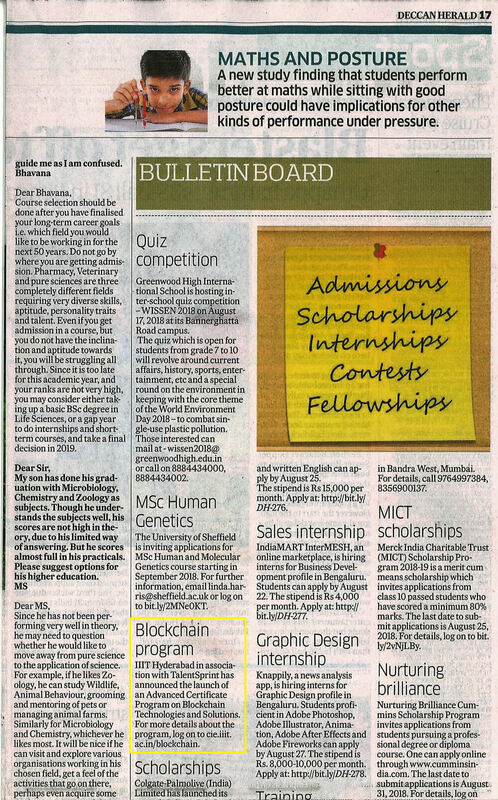 These were the observations of TalentSprint Managing Director and chief executive officer Santanu Paul, who was speaking on Wednesday at International Institute of Information Technology - Hyderabad (IIIT-H) at a roundtable on blockchain. Explaining the trend, Mr. Paul said that 'past hypes', such as Amazon, started selling books online in 1994. By 2018, it became the leading retail company by valuation. Similarly, it was in 1997 that IBM's artificial intelligence powered Deep Blue beat Garry Kasparov in chess in 1997. Now, he said, AI is disrupting every industry. Mr. Paul said a recent survey of 1,500 respondents has shown the demand for blockchain catching up with AI and machine learning. There has been an increase in interest from professionals who are between 25 years and 30 years of age. Touching upon the use cases of blockchain, speakers said the technology can be used to have transparent and tamper-proof system of voting and also validation of educational certificates, among others. 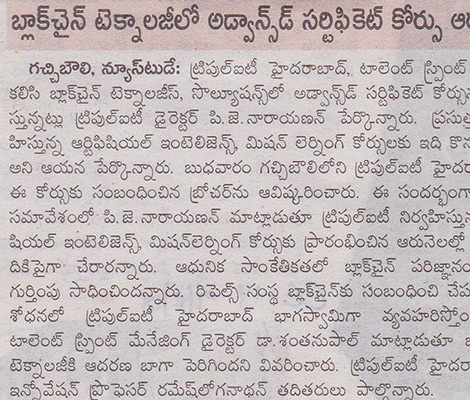 Speaking at the round table, IIIT - Hyderabad Director P.J. Narayan said the institutionÃƒÂ¢Ã¢â€šÂ¬Ã¢â€žÂ¢s Blockchain Centre of Excellence will focus on advanced research. 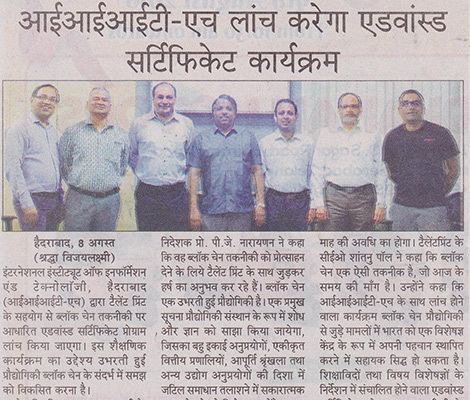 A collaboration between IIIT and TalentSprint was for the launch of an advanced certificate course in blockchain technologies and solutions. Santanu Paul, MD and CEO of TalentSprint, said Blockchain was a 'technology whose time has come'. 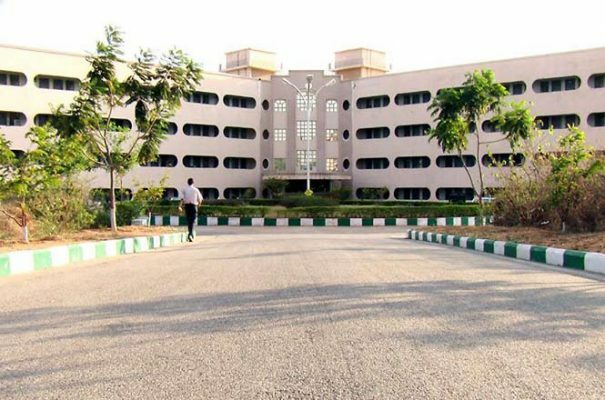 Hyderabad: With industry studies indicating a 700 percent increase in demand for Blockchain professionals globally, the International Institute of Information Technology (IIIT) Hyderabad has on Wednesday launched an Advanced Certificate Programme on Blockchain Technologies in association with TalentSprint, a new age digital platform. The programme will be offered at the IIIT-H Blockchain Centre of Excellence, according to IIIT-H Director PJ Narayanan, who said the institute was selected as one of the university partners for the RippleÃƒÂ¢Ã¢â€šÂ¬Ã¢â€žÂ¢s University Blockchain Research Initiative (UBRI) along with the Massachusetts Institute of Technology, University of Pennsylvania and other renowned universities. ÃƒÂ¢Ã¢â€šÂ¬Ã…â€œOur Blockchain Center of Excellence will focus on advanced research. This deeper understanding is the basis for the executive education programme. The institute is using its UBRI grant to expand its Blockchain Center of Excellence, which is focused on academic research, technical development, innovation and executive education,ÃƒÂ¢Ã¢â€šÂ¬Ã‚Â he said. Santanu Paul, MD and CEO of TalentSprint, said Blockchain was a technology whose time has come. For some Blockchain is the internet of money, for others it is the automation of trust, he said, adding that the programme could make India a major hub of expertise for Blockchain technologies and solutions. It will be an immersive programme delivered by a joint team of leading academics and practitioners, he said. 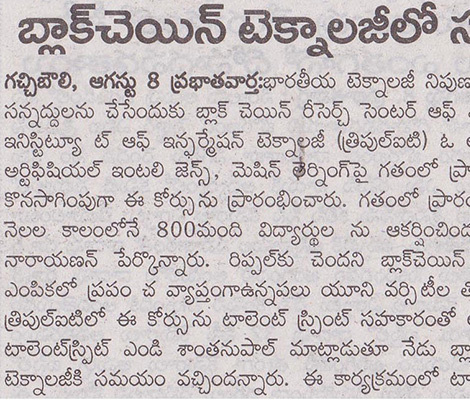 Hyderabad, Aug 8 (UNI) IIIT-Hyderabad on Wednesday has launched Advanced Certificate Program on Blockchain Technologies and Solutions in association with TalentSprint. This Advanced Certificate Program will enable deeper understanding of Blockchain technologies and how to leverage the same for building complex solutions for distributed multi-entity applications, integrated financial systems, supply chain and other industry applications. The three-month program will be delivered by faculty from the Blockchain Research CoE and practitioners from TalentSprint, with extensive hands-on assignments and capstone project. 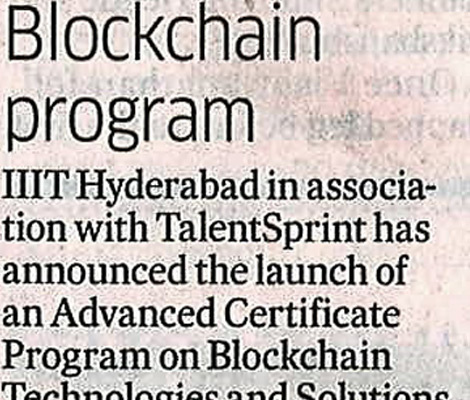 IIIT-Hyderabad on Wednesday has launched Advanced Certificate Program on Blockchain Technologies and Solutions in association with TalentSprint. Gartner has identified Blockchain as one of the top disruptive technologies of 2018. World Economic Forum survey suggests that 10 percent of global GDP will be stored on Blockchain by 2027. According to an industry study, there is a 700 percent increase in demand for Blockchain professionals globally. NASSCOM estimates that Blockchain has the potential to create value of up to USD 5 Billion in India in the next 5 years. Even central policy making organizations such as NITI Aayog have identified Blockchain as a key enabler of national infrastructure, the statement added. Similarly, it was in 1997 that IBM's artificial intelligence powered Deep Blue beat Garry Kasparov in chess in 1997. 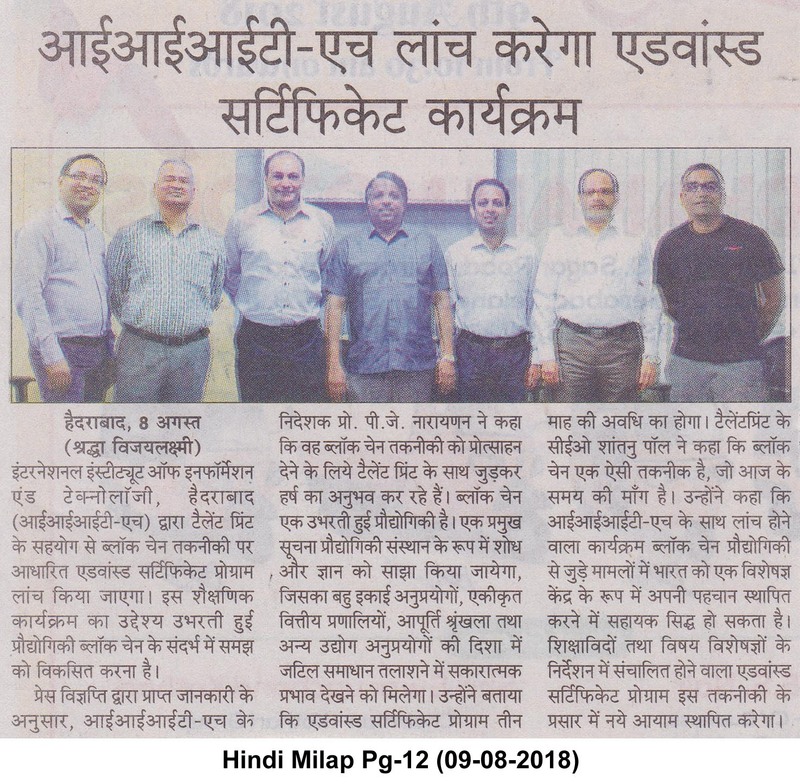 A collaboration between IIIT and TalentSprint was for the launch of an advanced certificate course in blockchain technologies and solutions. 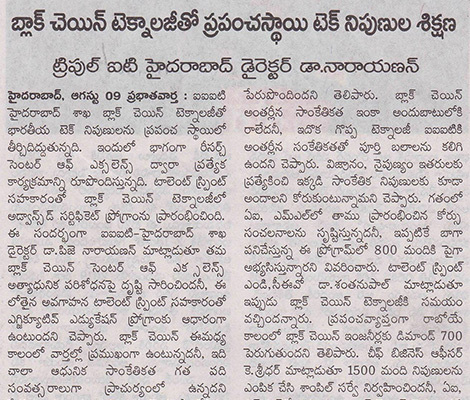 Speaking at the round table, IIIT - Hyderabad Director P.J. The 'hype' around blockchain is similar as it has the potential to cause disruption in key areas. Mr. Paul said a recent survey of 1,500 respondents has shown the demand for blockchain catching up with AI and machine learning. 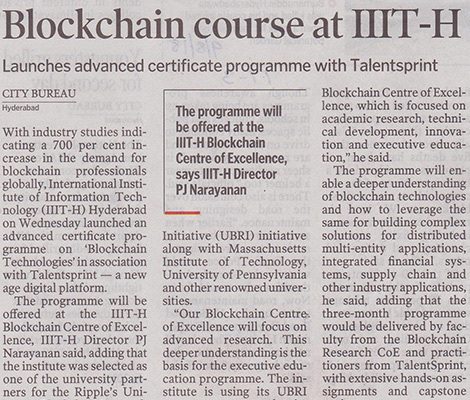 IIIT Hyderabad in association with TalentSprint has announced the launch of an advanced certificate program on Blockchain technologies and solutions. Gartner has identified Blockchain as one of the top disruptive technologies of 2018. The World Economic Forum survey suggests that 10 percent of the global GDP will be stored on Blockchain by 2027. According to an industry study, there is a 700% increase in demand for blockchain professionals globally. NASSCOM estimates that Blockchain has the potential to create value of up to $5bn in India in the next five years. Even central policy-making organizations such as NITI Aayog have identified Blockchain as a key enabler of national infrastructure. This advanced certificate program will enable a deeper understanding of Blockchain technologies and how to leverage the same for building complex solutions for distributed multi-entity applications, integrated financial systems, supply chain and other industry applications. The three-month program will be delivered by the faculty from the Blockchain Research CoE and practitioners from TalentSprint, with extensive hands-on assignments and a capstone project. 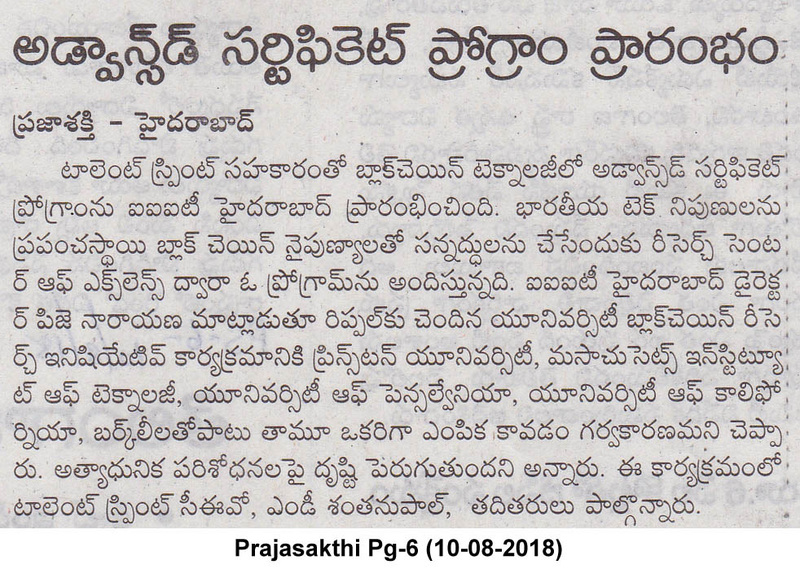 According to Dr. P.J. 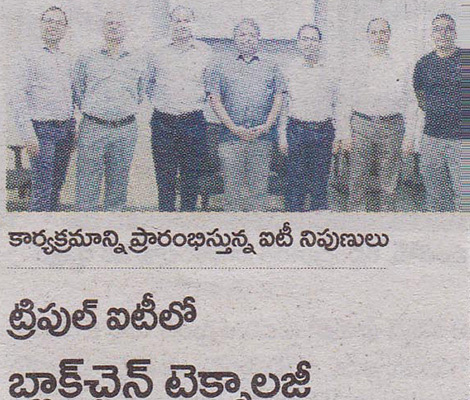 Narayanan, Director, IIIT Hyderabad, We have been selected as one of the university partners for Ripple's University Blockchain Research Initiative (UBRI), along with Princeton University,Massachusetts Institute of Technology (MIT), University of Pennsylvania (UPenn), and University of California, Berkeley. Our Blockchain Center of Excellence will focus on advanced research. This deeper understanding is the basis for the executive education program in association with TalentSprint‚ He said, "This is another new program we are launching. Blockchain has been in the news a lot, it's a very new technology, its been known for last ten years, which is not a long time. It's a practical technology being popularized by cryptocurrency, which is the most visible or glamourous application. The underlying technology of Blockchain is much more far reaching. It is a great technology and IIIT has strengths in the underlying technology, we have been running courses on Blockchain for our students. We also want to reach out to others, with the knowledge and expertise we have, especially the professionals here. The last program in AI ML we launched is making waves now, we already have 800 students in these programs, who are doing very well now. So,the time for Blockchain has come, we have strengths in it. We and TalentSprint have designed a program together. Don't know the catchment area for this course, as unlike AI ML, this is a little more niche. IIIT wanted a partner for this, TalentSprint did a fantastic job with the AI ML Program, so we are jointly working on this." Speaking to media here, Dr. Santanu Paul, MD & CEO, TalentSprint, said, Blockchain is a technology whose time has come. For some, Blockchain is the internet of money, for others, it is the automation of trust. 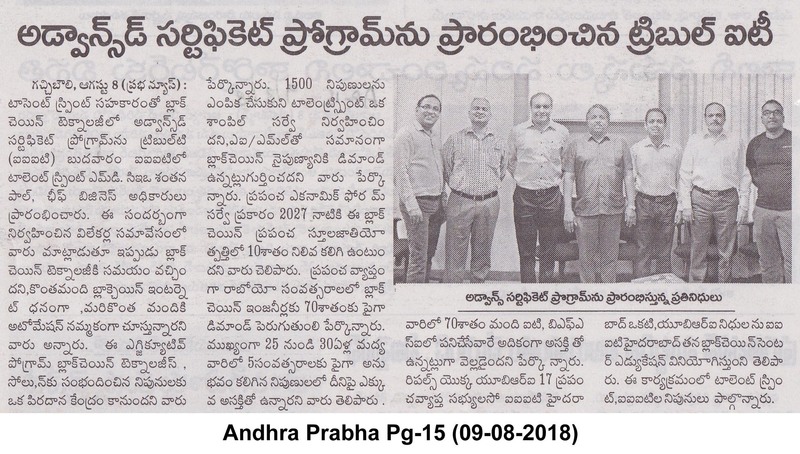 This executive program with IIIT Hyderabad Blockchain Center of Excellence can make India a major hub of expertise for Blockchain technologies and solutions. 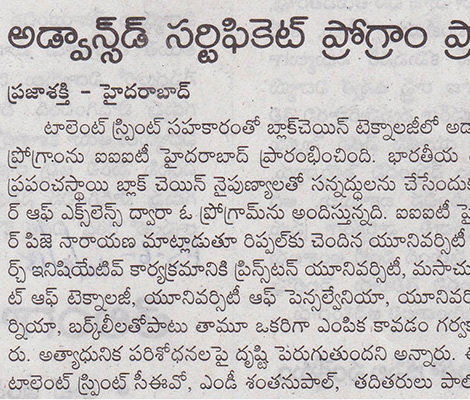 It will be an immersive program delivered by a joint team of leading academics and practitioners. He said, "According to World Economic Forum, 10% of global GDP will be stored on Blockchain by 2027. It has the potential to create $5 Billion value in India in the next five years according to NASSCOM and also there is going to be 700% growth in demand for Blockchain Engineers. In the years to come Blockchain will disrupt all sectors, Financial Services, Government, Supply Chain, Healthcare, Pharma & Biotech, Legal, Education etc. Blockchain is a type of distributed ledger for maintaining a permanent and tamper-proof record of transactional data. A Blockchain functions as a decentralized database that is managed by computers belonging to a peer-to-peer network. It is a convergence of many established disciplines." K. Sridhar, Chief Business Officer, TalentSprint, said, "TalentSprint conducted a survey with a sample of 1,500 professionals and found that the demand for Blockchain expertise is catching up with AI/ML, high interest was from professionals in the 25-30 age group; professionals having up to 5 years experience were keener, 70% of those with interest were professionals working in IT/BFSI. However, the awareness among women professionals about Blockchain was low. This program is for working professionals, having hands-on coding experience of minimum one year, seeking to master Blockchain technologies and are looking for a role change in disruptive Blockchain technologies." 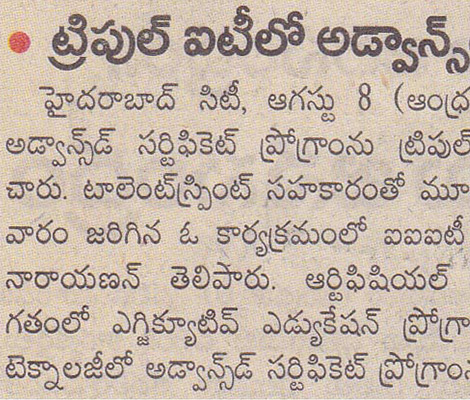 As announced earlier, IIIT Hyderabad is one of the 17 global members of Ripple's UBRI. 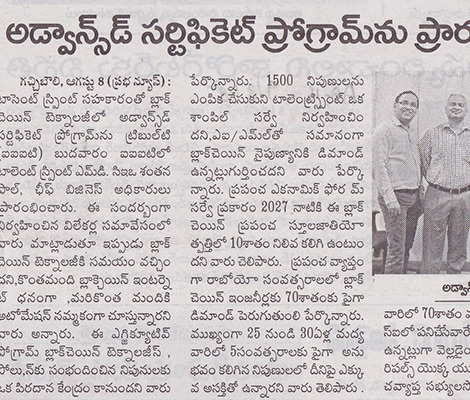 IIIT Hyderabad is using its UBRI grant to expand its Blockchain Center of Excellence, which is focused on academic research, technical development, innovation and executive education. According to Dr. P.J. 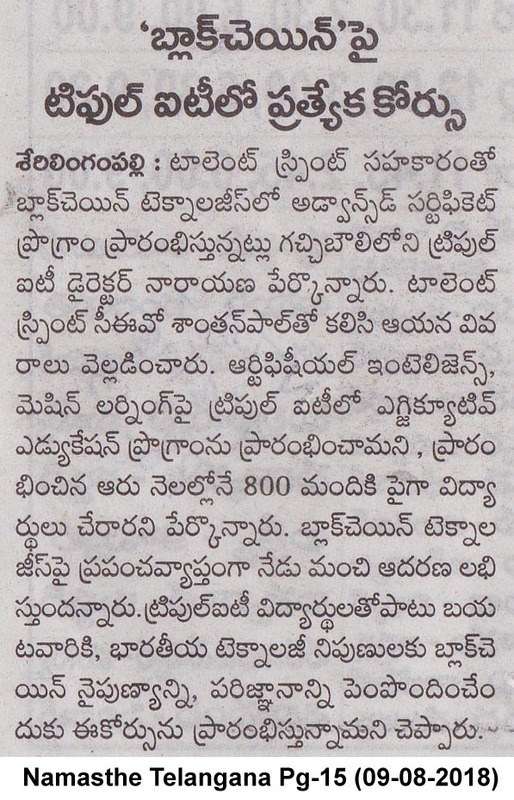 Narayanan, Director, IIIT Hyderabad, We have been selected as one of the university partners for Ripple's University Blockchain Research Initiative (UBRI) along with Princeton University, Massachusetts Institute of Technology (MIT), University of Pennsylvania (UPenn), and University of California, Berkeley. Our Blockchain Center of Excellence will focus on advanced research. This deeper understanding is the basis for the executive education program in association with TalentSprint. Speaking to media here, Dr. Santanu Paul, MD & CEO, TalentSprint, said, ÃƒÂ¢Ã¢â€šÂ¬Ã…â€œBlockchain is a technology whose time has come. For some Blockchain is the internet of money, for others it is the automation of trust. 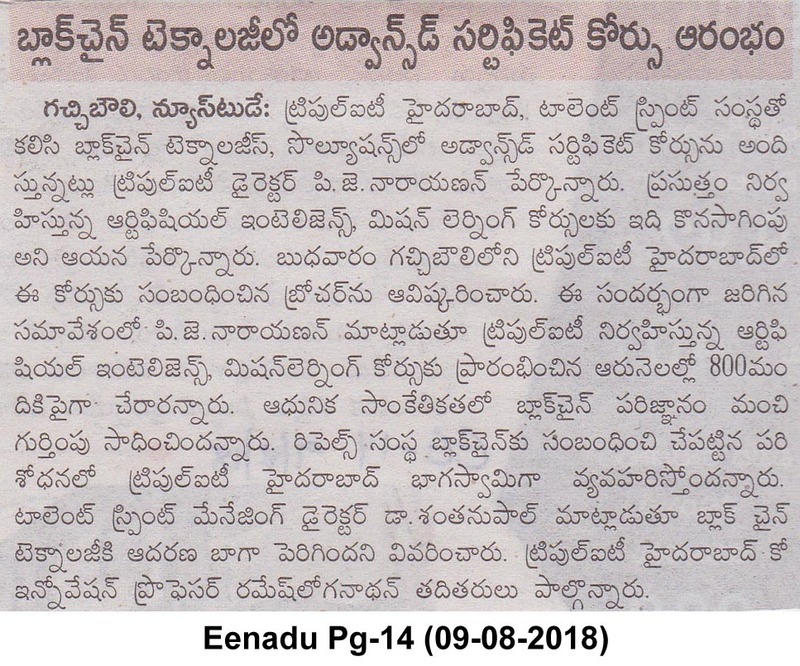 This executive program with IIIT Hyderabad Blockchain Center of Excellence can make India a major hub of expertise for Blockchain technologies and solutions. 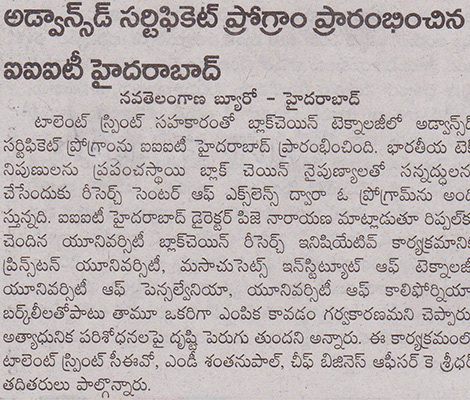 It will be an immersive program delivered by a joint team of leading academics and practitioners.